Start. St Mary's Church, Rydal. Route. 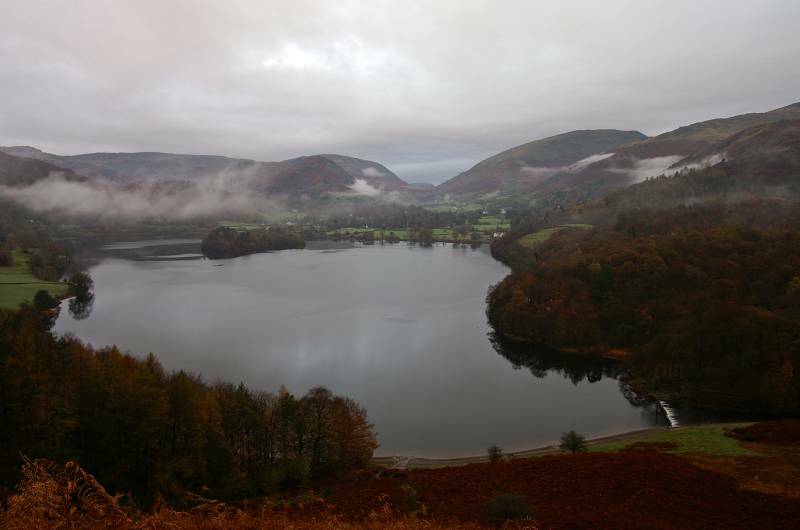 St Mary's Church - Rydal Cave - Loughrigg Terrace - Loughrigg Fell - Fox Ghyll - Under Loughrigg Road - Pelter Bridge - St Mary's Church. Notes. 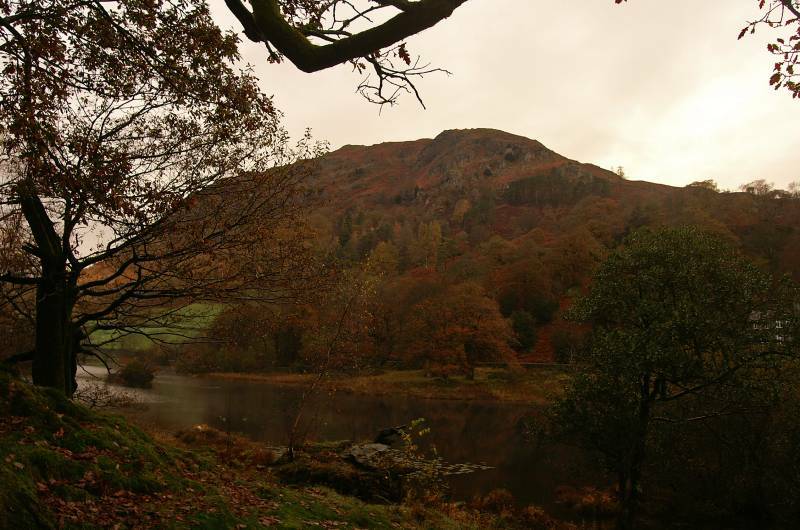 I decided to make the short drive to Rydal this morning, maybe capture some Autumn colours before summiting Loughrigg Fell, most of my morning was spent wandering through not heavy but persistent rain, a brief respite on the summit before the cloud rolled in once again. From St Mary's Church I followed the main road north, opposite the Badger Bar a path leads down to a foot bridge spanning the River Rothay, I crossed to enter ancient Oak woods. On leaving the woods I had a choice, the high path or low. 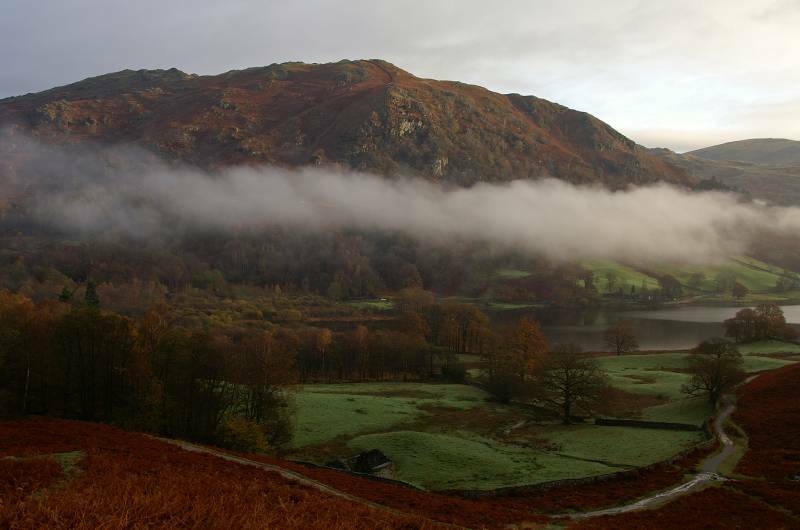 It was high, passing Rydal Cave en route to Loughrigg Terrace. 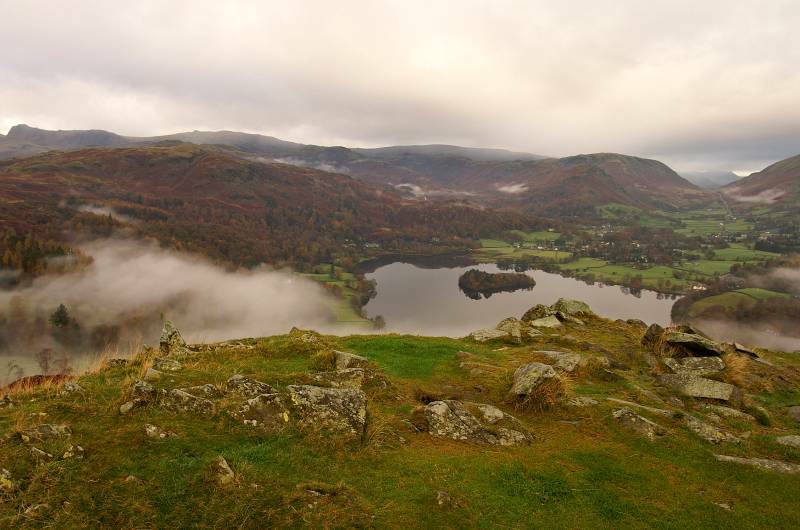 When the terrace ended I swung south to ascend the steep slopes of Loughrigg Fell, a few pauses to catch my breath and I was soon at the trig point. Several paths leave the summit, I followed the one descending into a high valley. 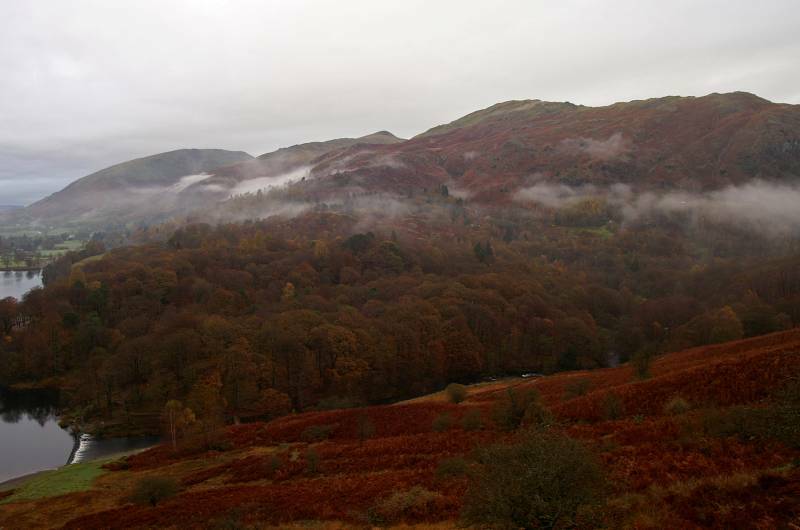 Heading south I was soon scrambling down a low rock face to cross Black Mire before reaching the main bridleway connecting Ambleside and Langdale, after fording the beck I turned left in the direction of Ambleside, it was a short walk to the intake wall. Here I ignored the gate to follow a permissive path along the wall edge, the wall and path swung right allowing me to descend on a very wet path, following the waters of Fox Ghyll eventually crossing a footbridge to enter Fox Ghyll Woods. 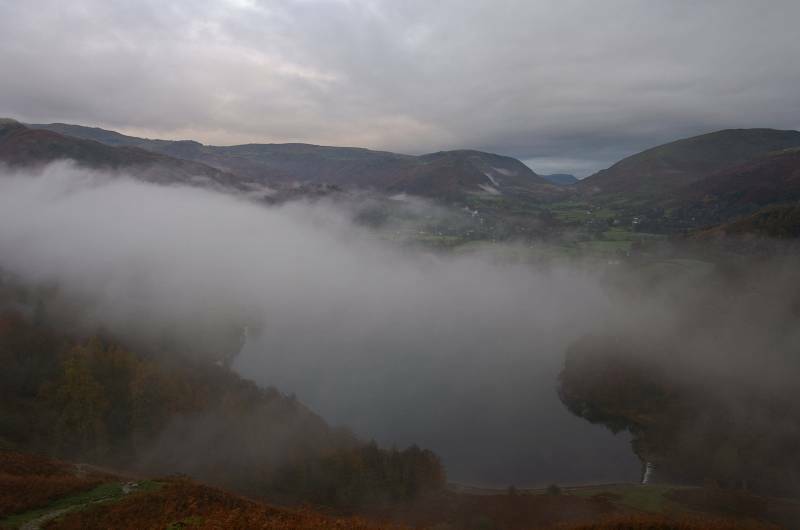 Still descending but now over a carpet of fallen leaves I reached a tarmac lane, I turn left, the lane carried me past the stepping stones then on to Pelter Bridge where I gained access to the main road, the car was parked just round the corner to my left. 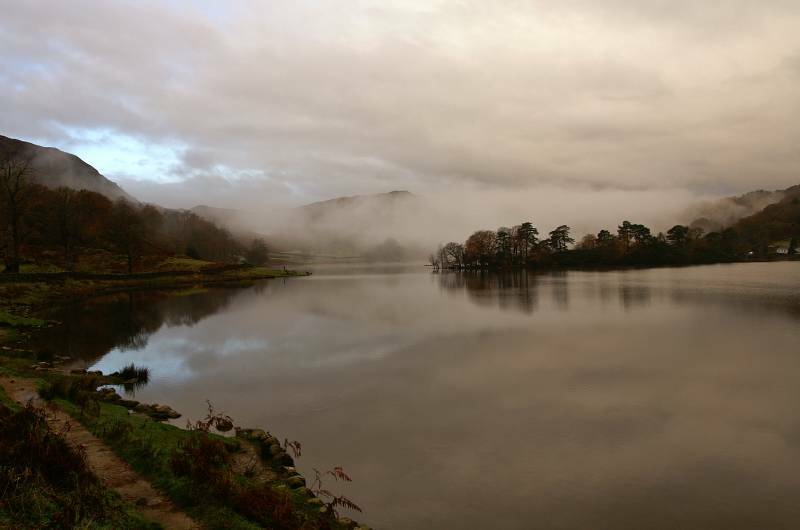 Swathed in swirling cloud, the head of Rydal Water. 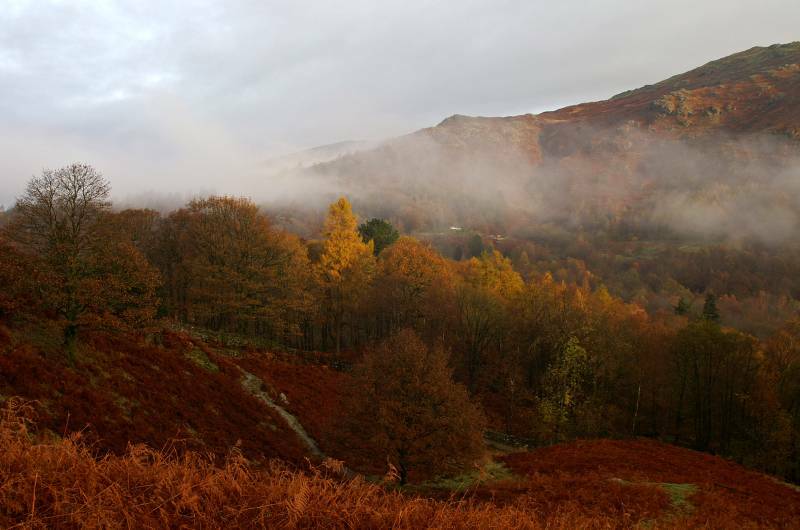 Nab Scar in all it's Autumn glory. 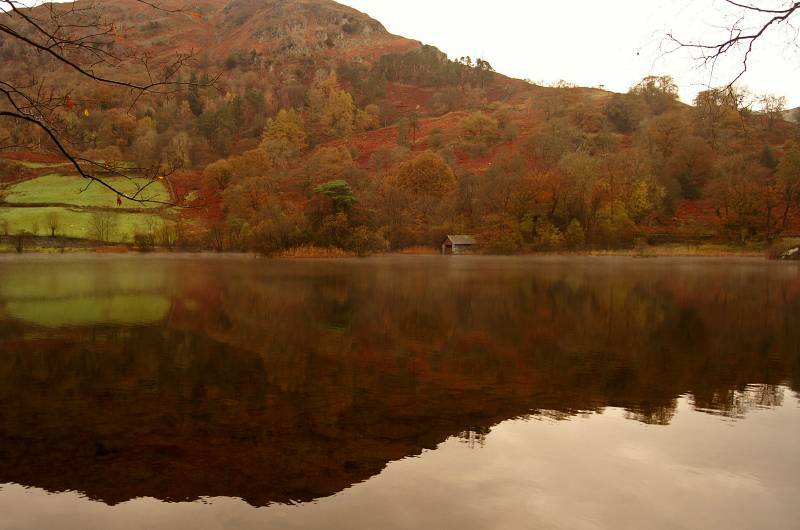 Wonderful golden reflections, The Boat House in the shadow of Nab Scar. 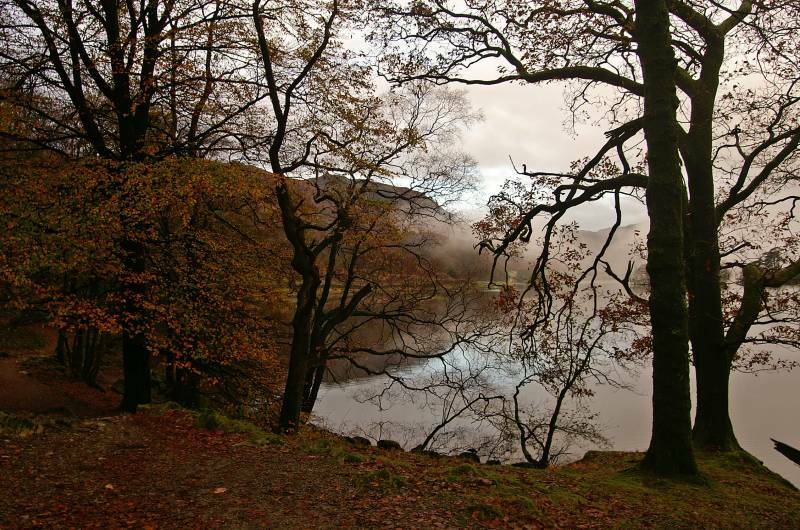 This is a splendid stretch of path, especially at this time of year, views taken along the south shore of Rydal Water. 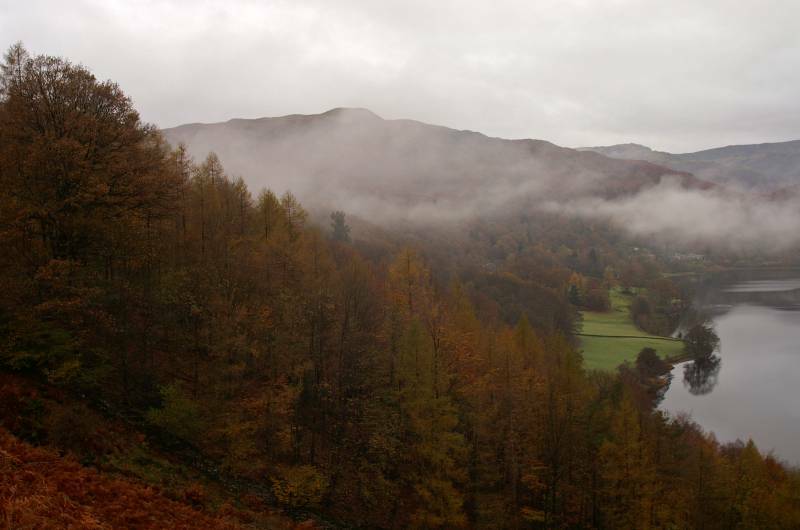 Looking over Rydal Water on a day that promises sunshine or showers. 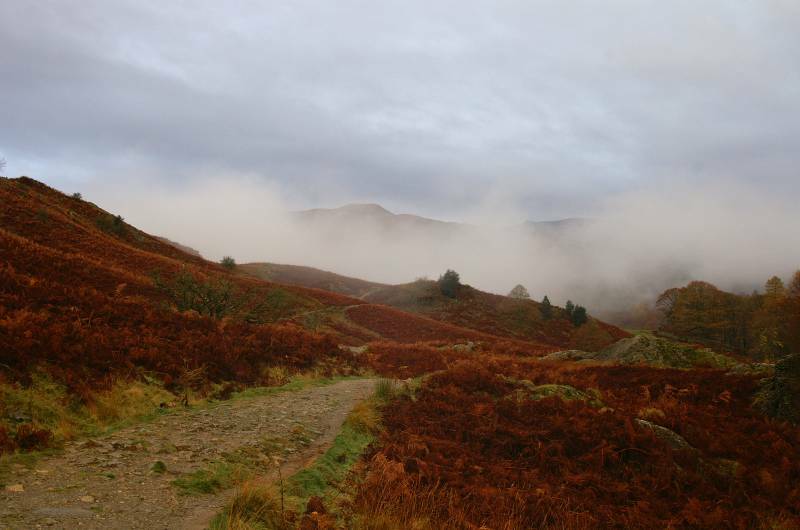 On the high path heading to Loughrigg Terrace, with Silver How seen above the cloud, just. 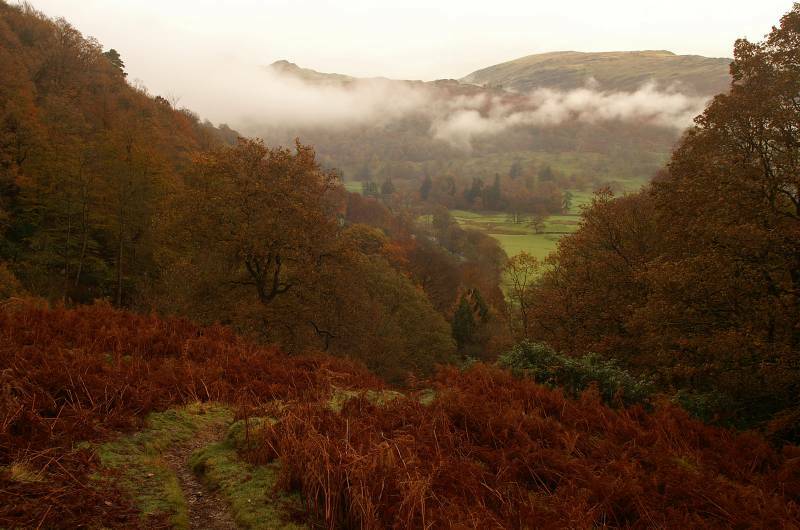 Stunning views back to Nab Scar. Sunlight catches the mixed woodland on White Moss. 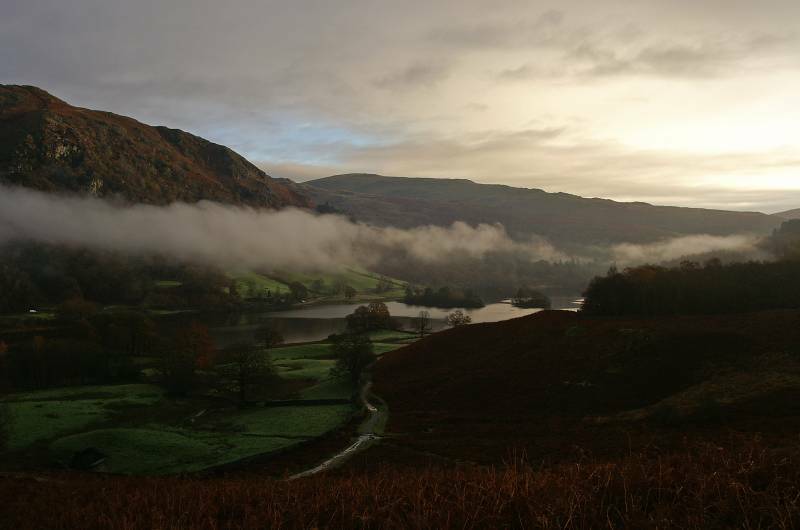 On Loughrigg Terrace with a magical view back to Rydal Water. Heron Pike rising above White Moss Common. 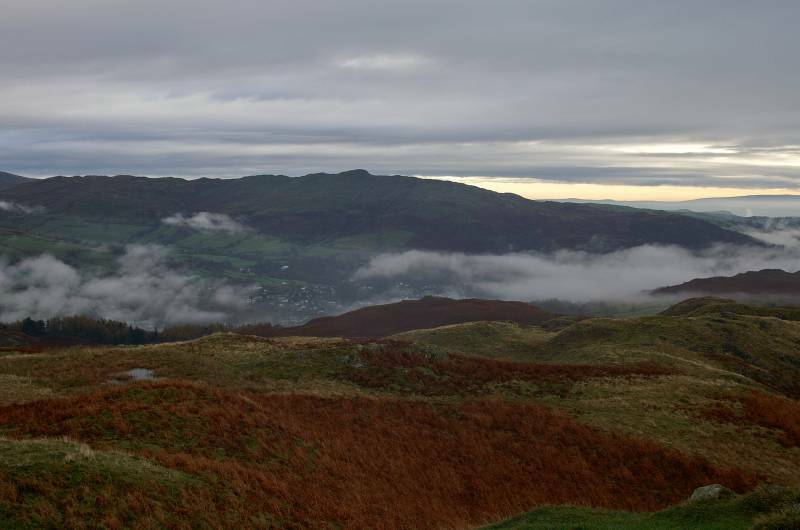 From the well trod path over Loughrigg Terrace wonderful views over Grasmere. Silver How as seen over Red Bank Wood. 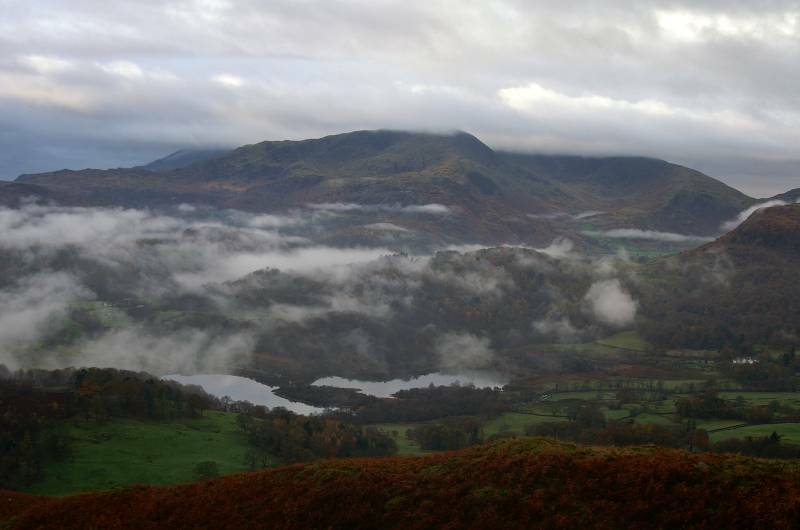 On the steep northern slopes of Loughrigg Fell, soaking up the views over the Vale of Grasmere. 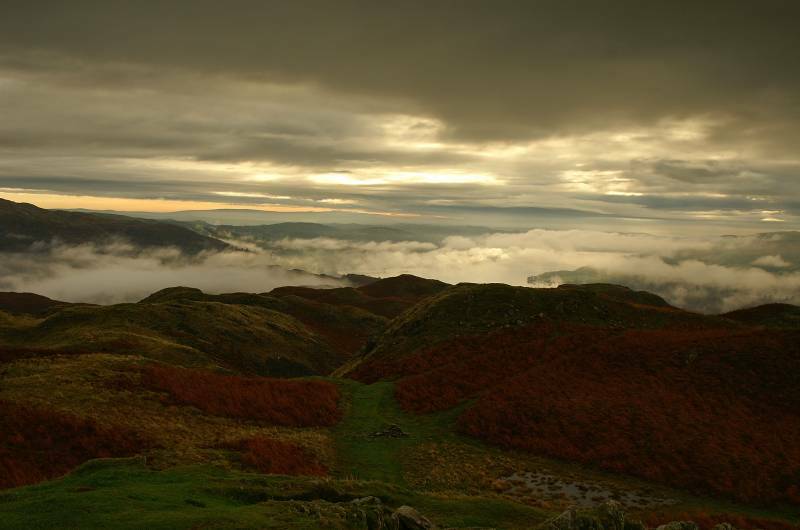 Before the cloud obscures the view, Heron Pike leading to Great Rigg with Seat Sandal gracing the far horizon. 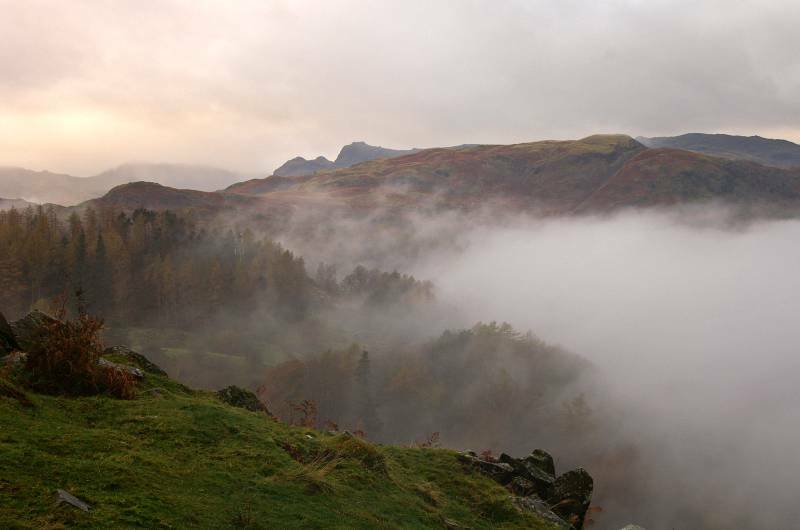 A glimpse of the Langdale Pikes (top right) seen over Huntingstile. Lurking behind Silver How the rugged profile of the Langdale Pikes. 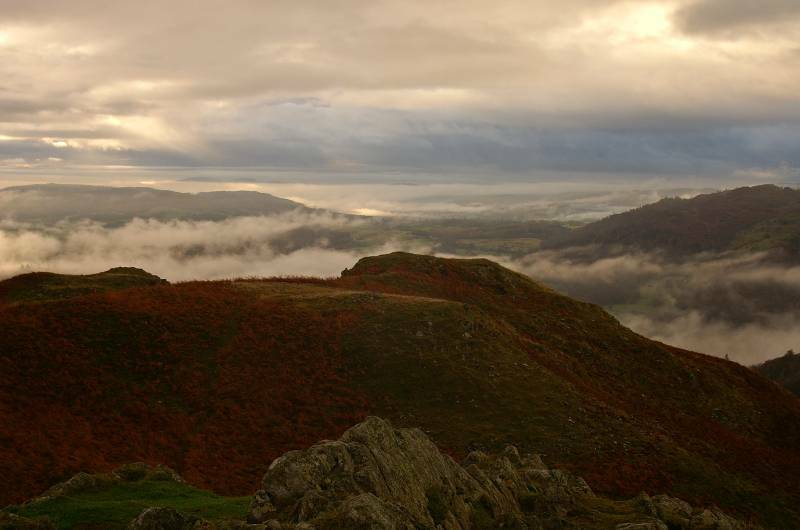 Nearing the summit of Loughrigg Fell with a fine view to the head of the Langdale valley. 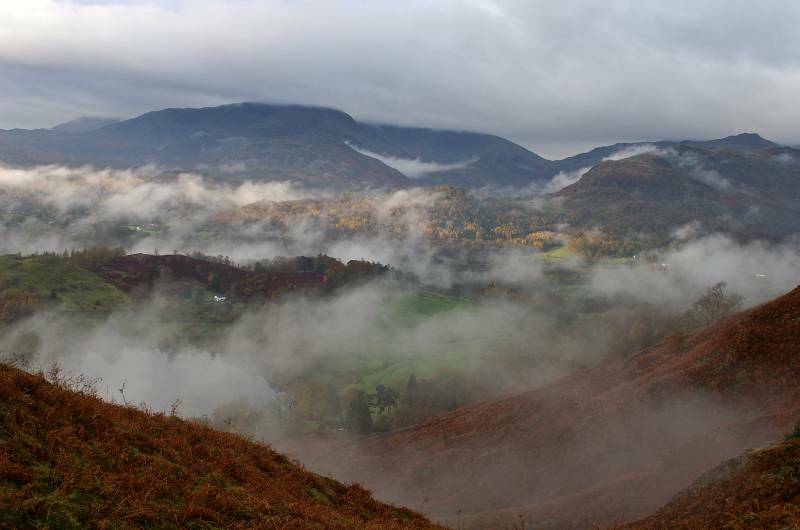 A stunning panorama over Grasmere, top left the Langdale Pikes and Pavey Ark leading to the whale backed summits of High Raise and Ullscarf, followed by Helm Crag backed by Steel Fell, the dip into Dunmail Raise, finally the steep slopes of Seat Sandal. 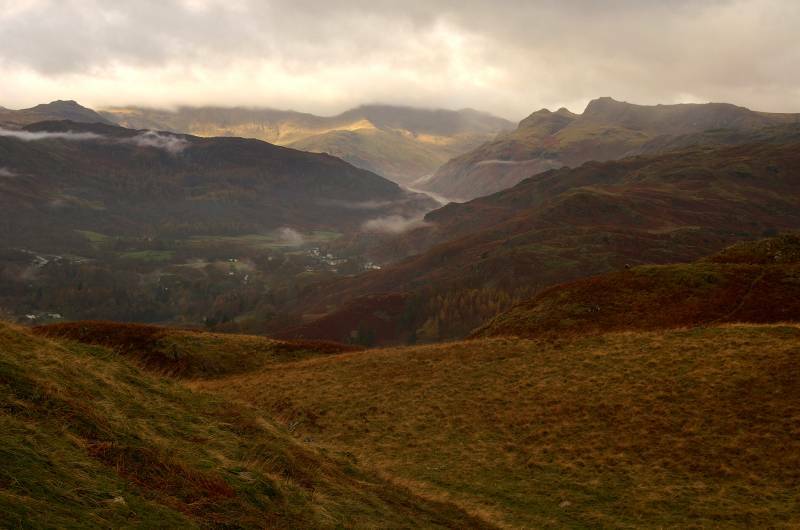 Sunlight across the slopes of The Band with the Crinkle Crags and Bow Fell under cloud, to the left above Lingmoor Fell, Pike O" Blisco, far right the Langdale Pikes. 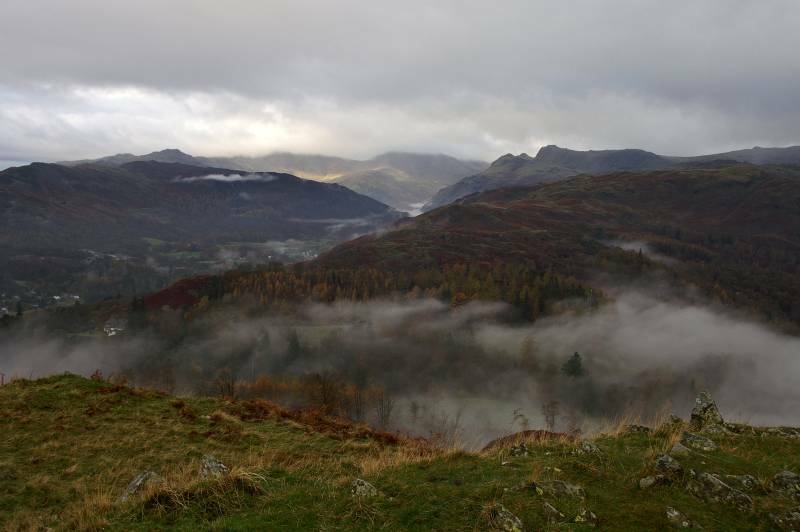 From the summit of Loughrigg Fell a stunning view through the Coniston valley. Yoke, Ill Bell and Froswick seen over the lower slopes of Red Screes. 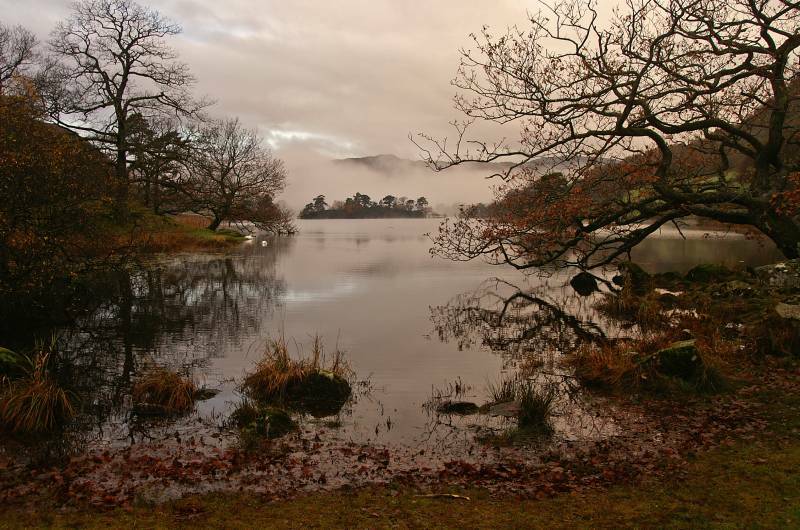 A mouth-watering view over Windermere Lake, it's views like this that make getting wet worth while. 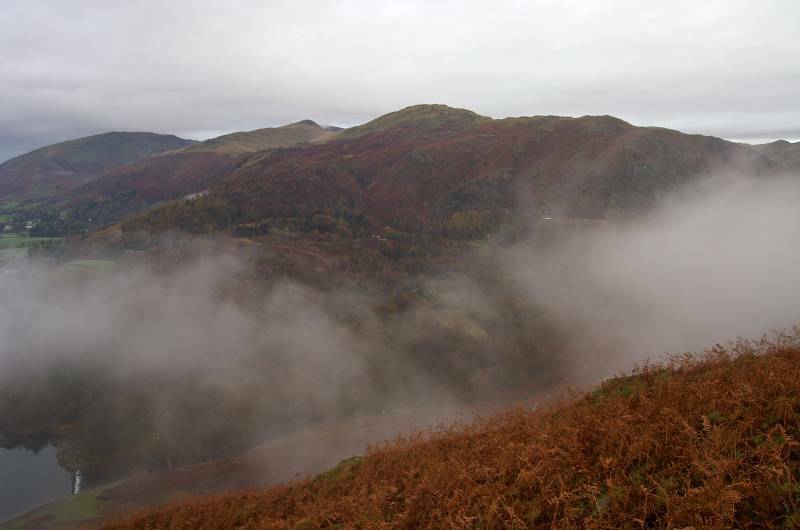 Far below Elter Water, dwarfed by the giants of Wetherlam and the Coniston massif. 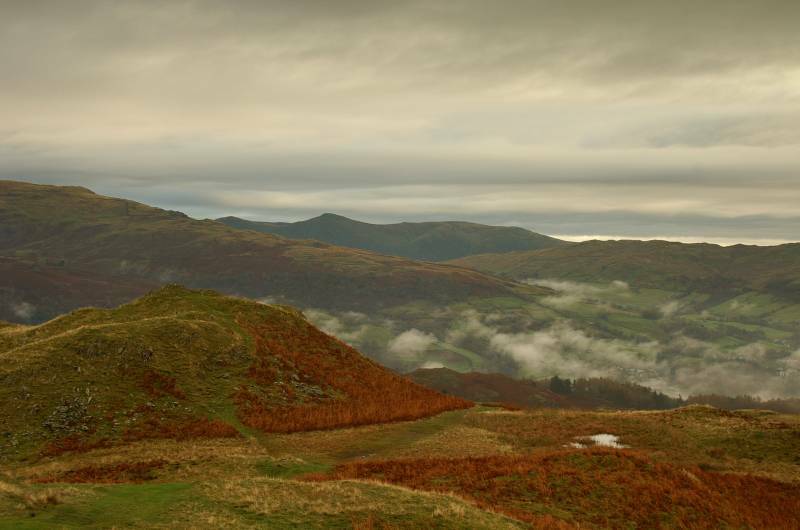 Seen over Ambleside the ever popular Wansfell Pike, with a promise of better weather to the south. 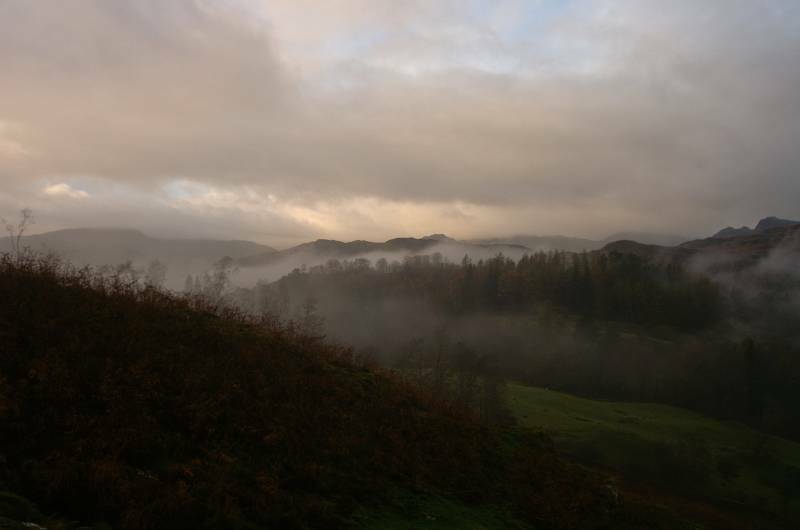 A striking view over the Langdale Valley, sunlight on Fletcher's Wood with Wetherlam grey on the horizon. 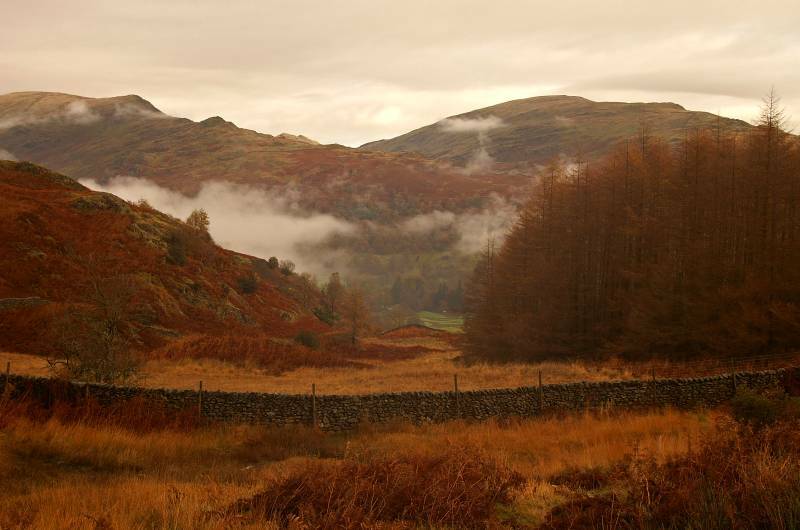 A very autumnal scene, looking to Nab Scar and Red Screes, my route followed the wall, out of shot to the left then down into the valley. Descending Fox Ghyll looking to Nab Scar and Red Screes. 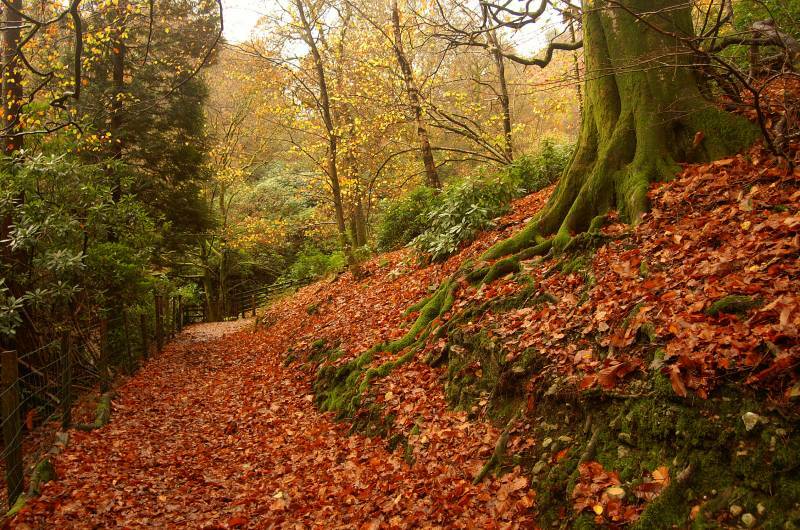 The path through Fox Ghyll Woods. 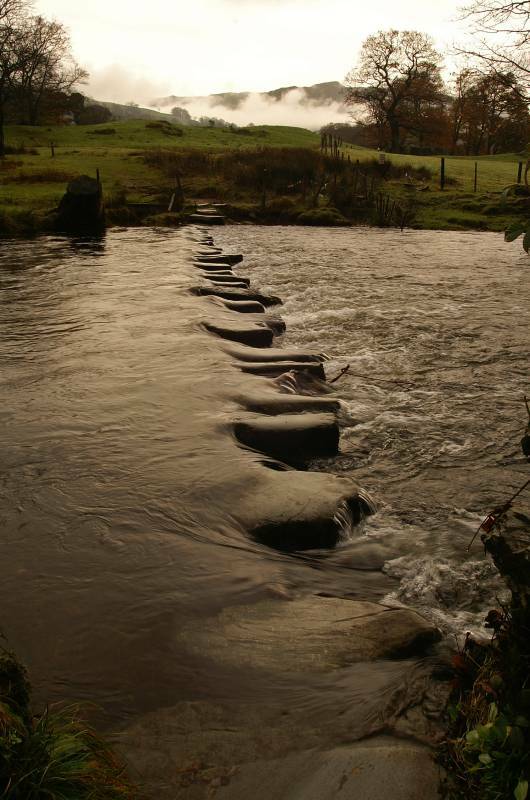 The Stepping Stones, I don't fancy my chances today.